NOTE: The 10 foot leash is not one continuous piece of leather. The handle and by the snap are modified to attain the 10 foot length. Our leather leashes are designed for everyday use by pet owners who want the best leash money can buy. 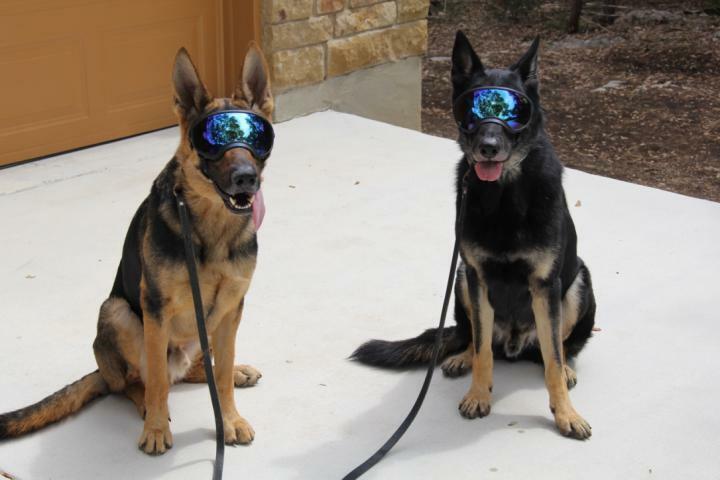 They are used by Police K9 Handlers, military working dog handlers, trainers in every major dog sport along with professional dog trainers. Since we cannot make a ten foot leash with one continuous piece of leather, we modified the design. The handle and snap ends of leather are sewn and riveted onto the main portion of the leash. The leather is not spliced together along the length as many other manufacturers do. We bought two of your Amish leather leashes years ago and they have actually outlived several large, active dogs we have owned, despite nearly daily use on walks! Great product. I am on my second Therapy Dog, these are best leashes ever. Quality, forever lasting, and solid. Looked for long time to find the perfect leash and this is it. For the money it’s best leash I have found! After owning several of Leerburg's Amish leather leashes for over 7 years now I figured it was time for a review. I have 2 working line GSDs that I have used everything from the puppy leashes, 3/4 leashes, prong collar leashes, and couple of the specialty type leashes for different purposes on them. I have also given these leashes as gifts to friends with dogs, which has always gotten the comment of where did you get this leash it is really nice. Every single one that I have purchased are doing their job with no end in sight. Super high quality and very soft. My leashes have gotten wet, muddy, even snow covered a few times here in Texas and they actually get softer with use. I'm glad there are still some folks around that believe in making high quality merchandise so a huge thanks to all at Leerburg and the craftsman that make these leashes. I cannot tell you how many leashes I own. Cloth leashes, plastic leashes, nylon leashes, competitor's leather leashes...my closet looks like a store! When I received the 4 ft., 3/4", brown leash I was pleasantly surprised at how comfortable it felt in my hands. This is a quality leash!! Like other people, I have shopped for what I believed to be a quality product based on reviews, only to be disappointed and out big bucks. I know this sounds crazy, but my black lab, who is a puller, responded beautifully to leash pressure with this leash. Perhaps part of the reason is that I felt confident that the hardware on the leash wasn't going to snap. Somebody mentioned that competitor's leather leashes feel cheap...yes, they do!! I am originally from Wisconsin and am very familiar with the craftsmanship of the Amish.You will not be disappointed with this purchase. Thank you, Leerburg for saying what you mean and meaning what you say! I have 2 dogs. I'll be ordering a 2nd leash! I've had three of these Leerburg Amish-made leashes, and I just ordered one for a friend. These leashes easily last more than 10 years. And the soft leather is easy on your hands (whereas a vinyl strap-type leash can dig painfully into your hands). The first leash I replaced only because I got a much bigger dog. That leash was 3/8 inch, but for a dog over 60 pounds you need the 3/4 inch leash. Best dog leash you will find. I have been buying these leashes for my dogs for over 10 years. Ed is not lying that these will last your lifetime rather than your dogs, the only time I ever had to replace one was when I slammed it in a car door and it was cut. The leather is extremely high quality and soft as is the hardware and the stitching and craftmanship. I will never buy any other leash. I have had this leash for over 5 years now. Still looks and works as well as the day it arrived. I walk my golden twice a day, rain or shine, (and here in Portland it's a lot of rain). Still supple and soft, and brass clasp has never gotten stiff. Came back to the site to order a 2nd leash since I have added a 2nd dog. Best leash I have ever used. The quality of the leash looks and feels great. Mailed quickly with the high priority shipping option. The distressed leather is darker in person than what the online photos show. The leather leashes in pet stores feel so cheap which is why I took my business elsewhere to find a quality product. Overall I’m happy with my purchase and would recommend this quality product. I highly recommend this leash to everyone. I also recommend getting a nice coat of saddle soap/mink oil to help break-in of the leather. At Leerburg, you get the best quality products at very reasonable price. Please plan ahead and use their flat shipping offers. We've had our leash for 11 years and it's still in great shape. When you consider the quality of the craftsmanship and durability of the leather I actually think this is a good value despite the price. I needed a leash that my hands could grip (I have neuropathy) and could withstand some pretty regular tough times. My dog is leash reactive so I got the 4' which has enough room to work with but it's quick to take up if we see another dog on the trails; my dog is also trained to pull on command to help me use less of my own energy so our walks and hikes can last longer. I have a very go, go, go dog! This leash is perfect. I'm so unbelievably happy with it. It is soft and supple within the first 2 weeks of regular use, and around a month in I cannot find anything wrong. I'll definitely be ordering all my future leashes from Leerburg. Thanks for making a great product. Best. Lead. Ever. Very well built , strong and great quality leather leash. It was bit stiff when I originally received it , but after about 2 months of use it became nice and soft. It is definitelly leash that will last long time. I recommend this product ! There just isn't a better leash out there. I've purchased leashes elsewhere, that now sit in a box, because they just don't match the quality of these leashes. They don't need to be broken in. They're comfortable to hold, and don't have a rough side like so many leashes have that are hard on your hands. I have 3 German Shepherds that I walk at the same time using these leashes. I absolutely love them and wouldn't buy anything else. Recommend them to everyone. Great product!!! I have been searching for the perfect leather leash for a while. I had them fancy rope climbing, biothane, slip on's, you name it, I've have them all. I finally bought this leash and I can't believe I didn't buy it sooner. It is absolutely perfect. Soft yet strong. Finest quality I've ever seen. I've paired this leash with the 6in pull tab for off leash walking...You will not be disappointed. It says "Recommended by Ed" for a reason. The man knows his business! I bought my first Amish leather leash from Leerburg about 4.5 years ago. I have many different ones, but my 6ft 3/4" version is my go to every day leash. I have 2 working line GSDs that have have used others in their training since puppyhood. These leashes are strong, soft on the hand and get softer with use. I have not come across a better leash and I have now given these to two different friends as gifts and they love them. If you have friends with dogs that go through a ton of leashes give them one of these as a gift or the smaller ones if they have a smaller dog and they will love it. Photo of my boys (Shane & Quinn) ready for action with their Amish leather leashes. I love this leather leash. My male is half Rottweiler and very strong. This leash gives me more power of the handling of the leash verses non-leather leashes, that slip right through my hands. I'm not one to write reviews or post on a blog but I bought this leash in 2003 and I can tell you that it only gets better with age you can't ask for a better leash! It's even been swimming many times and and you can tie it in a knot like a soft rope, this comes in handy when your out on the training field. I'm now planning for a second dog so I'll be buying another one. The quality is second to none! Best leash for training and walking without having too much extra feet to deal with. Have several Leerburg Leashes and after a couple weeks use they feel like silk. Everyone that holds the leash comments, OMG, this feels wonderful, where did you get it.You can't get better prices for the best quality.I would guarantee that. I'd like to recommend ordering from this wonderful company. All the items I've ordered are of very good quality and customer service was excellent. I had a problem with one of the items and they immediately sent me a new one, even though I'm on the other side of the world. Thanks a lot Leerburg! This is an outstanding quality made leash. We carry this leash and the black tactical leash (with the second loop handle) for our clients. We and they love the feel and security of this leash. It's very strong and gentle on your hands due to the soft leather material. We not only re-sell this leash to our clients but I also provide them to my trainers to use in our training kennel. I highly recommend it! Excellent quality for the price- I was shocked! You will be glad you purchased this leash, I was. We are training our Doberman to sit and stay- that's what we are using this 10 footer leash for. Excellent choice. I use this leash daily. High quality, sturdy, and feels well made. I'm glad I purchased this product. The leather takes a week or two to "wear in", but now it feels great! 4ft of thick leather. Could not buy this quality at a local store and most likely would have cost more. I have had three German Shepherds and have tried almost every type of leash out there. I was looking for a short enough lead that I could comfortably maneuver my youngest guy through the crowded vet's waiting room, yet have enough length to allow him to lay down on command. This 4 foot leather leash is absolutely perfect: the right length, top quality, and a wonderfully solid "feel" in hand. 5 stars to this! I bought this leash thru amazon. I have had my Rottweiler almost 4 years and have gone thru many leashes. This Amish leather lead is by far the best one I have ever had. It is quite thick & sturdy but very supple at the same time. My dog tends to want to chase cats & my hands would get leash burns from other leads. I absolutely love it and highly recommend it. I won this leash in your weekly giveaway contest and wanted to thank the folks at Leerburg for offering such high quality products for prizes. What a generous gift! I've had dogs for over 45 years, and this is the finest leather leash I've ever had. The quality and craftsmanship are excellent. The leash is thick yet incredibly supple and not at all heavy to hold. It's well sewn, with a nice, wide loop end. The sturdy brass snap works smoothly, easy for my arthritic thumbs to use, but strong and well made. It adds to the overall elegant look of the leash. I worried that the snap might be too much for my 22 lb Eskimo/terrier cross, but attached to her harness, she doesn't notice any extra weight. There's nothing negative to say. I'm thrilled to have received it, and know it will last the life of my dog and longer. I've had my 6' leash and collar for my dog, a chocolate lab, for 8 years. They have endured lots of punishment and still are in great condition, in fact, look almost new. The leash has a little bit of wear because one time I drove 40 miles with the handle hanging out of my car and dragging on the expressway. Only a few scratches on the handle. My dog loves to swim and the collar is still in great shape. They probably will last her the rest of her life. Love the quality and durability!! I highly recommend them! I bought the 6 foot leash. I bought it because Jeff said I should. Was he ever right! I have a 102 pound, high drive German Shepherd. I have lots of leashes, maybe 6 or 8. This is the Cadillac of leashes. Seriously. It is so easy on the hands, very soft with a natural cushion to it. It is a pleasure to walk my bruiser. This leash sent all my other leashes into retirement. It's the only one I use. The quality is Amish, so it will probably last forever. I give it my highest recommendation!!! to our family and friends. This is easily the best leash I've used. A 'must have' piece of gear for any dog owner. The quality is outstanding, and it is durable enough to be used for many years. Even after rigorous use over a long period of time, you can clean it up with some saddle soap, and it looks brand new. My black 10 foot lead arrived and with all your products right out of the box, you know its the best lead in the world. I have four Dogs. My Pyr works with me as a therapy dog. My Plott I'm training for tracking. I can't say enough about this product, when you're out in the field you need a lead that won't let you down. If I'm in a tracking event or if I'm in a hospital with my therapy dog, I can't risk my dogs breaking a lead, which the Pyr has done. Please keep up the great work, my next purchase will be the Amish leather Collars. Just wanted to write and let you know how great your 10ft leash is (Model 5126). I love the larger loop handle, the reinforced stitching and grommets, and the soft leather. I had a Mascot knotted leash before this one, and the metal clip broke, sending my little 7-month old boy (attached - 4 months in that pic) flying into the street. I sent a scathing letter to them, as I found out from the pet store that others had issues with that leash as well. This was inexcusable, as the leash and collar often times hold your pet's life in their hands, so to speak (pun intended). After that incident, I thought I was going to have to custom build my own freaking leash... but turns out you kind folks beat me to it. Well done, if I can be so bold. Today I'm ordering the 4ft leash for more precise healing and walking in crowds. Please be certain I'll recommend you and your product(s) when the opportunity presents itself. A very nice and versatile leash. My dog just chewed it in half in one sitting, so certainly not indestructible, but its very comfortable and looks good. I'm ordering another one. Just don't leave it lying around where a chewer can get it! We have had this leash for 6 years and use it most every day on a medium sized lab. After 6 years the stitching is coming undone and the brass clasp has pulled out 3 times so I have reinserted it and squeezed it back in place. There is a little taper on the end which helps it to come loose. It is time for a new one so I am going with the stainless steel clasp instead of the brass one. I've been using this leash for a few months now and the more I use it, the more I like it. The leather has worn well and is very comfortable to hold and manipulate. The stitching has likewise worn well. I do recommend this item. This leash is very well made. However, it smells very much like good leather, which my beagle found very appetizing. She chewed it in several spots the first day she had it on, but it is still useable.